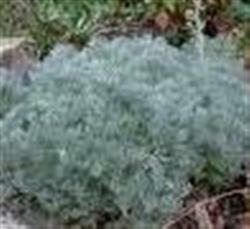 This tightly mounding shrub has delicate silvery leaves, then produces taller flower stems as it matures. Cut the flower stems back to maintain it's neat habit. Well-draining soil is a must for this plant and be sure not to over water. It is an excellent plant for the front of a border or use as groundcover where it's delicate foliage can be appreciated. use it to contrast against darker green plants such as low-growing ceanothus, adenostema 'San Nicolas' or Iris. It is at home on the coast but also thrives inland. 'David's Choice' was selected from Point Reyes and introduced by David Amme in 1980.